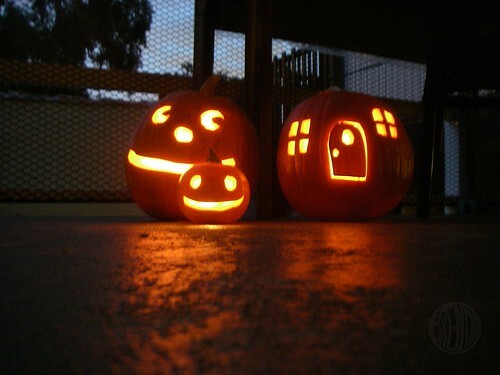 Happy Pumpkins and Costumes Day! Ghhirr! Vhwhirr! All I need now is a cockroach, some goggles and I’m set. 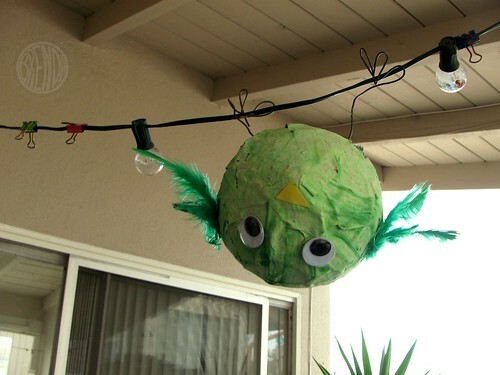 Do you need a last minute costume? I can’t recommend this enough. It’s SO easy. 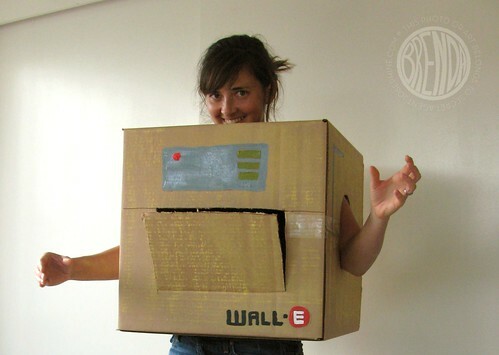 Walk down to your nearest mailbox store, buy a cube box that will fit you, cut some holes, write the word Wall-E on the bottom and you’re done! Of course you can be like me and paint in the logo (badly) and some buttons. I didn’t feel like painting it yellow though (too busy and I have a toddler who likes to “help” and then go run and jump on my white couch in a single breath). So I borrowed some of Bug’s yellow chalk and rubbed my color on. Later when I was putting my Wall-E box up high on the table so my super toddler wouldn’t try to use the arm holes as a bean bag toss game, I accidentally put my box too close to Bug’s brand-new-just-finished-hand-sewn Eva costume and now there is a smudge of yellow on it! DOH!!!!! Grrrrrrrr. Thankfully, it’s just a small smudge that mostly blew off but I was not happy about it. You see, I traded her hand-sewn Eva costume for a painting (that I have yet to finish) with my friend Tammy. Remember Tammy? The girl who sewed Baby Bug’s mermaid tail when she was an itty bitty baby? Tammy is so sweet and talented. And guess what?!!! Before she could deliver the costume to me, she got sick with appendicitis and went to the hospital for surgery!! Going to the hospital with a burst appendix has to be top of the list for reasons to not come through on a costume trade. Well, guess what? Tammy came through. From the hospital, while she was probably gasping on her hospital bed, Tammy’s husband emailed me from his phone (They didn’t have my phone number because I never gave it to them!) that Tammy could not make it and needed to reschedule. Reschedule we did and one day later an appendix-less Tammy stood up, walked from her car and gave me Bug’s Eva costume. Chariots of Fire should have been booming from the sky. It was one of those moments. I should have hugged her but Bug beat me to it first. Bug doesn’t hug many people but she looooooooves Tammy. I love Tammy. She’s a real-life super hero and I’m not being sarcastic. Now, if I can just get Bug to wear her costume so we can all see how cute she looks as Eva! She is so TWO sometimes. I’m hoping that tonight with all her cousins and buddies dressed up, she changes her mind about the run-like-crazy-so-mommy-can’t-catch-you every time I suggest we put on her costume. 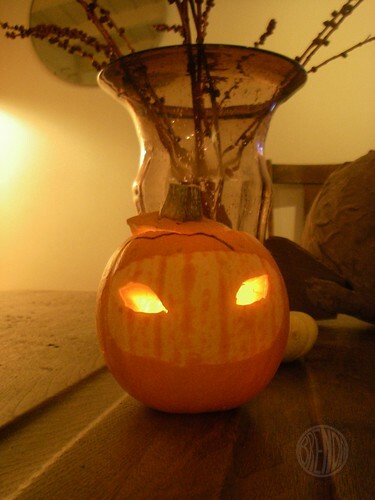 We do have photos of an Eva pumpkin! This pumpkin looks more like a ninja to me but the toddler queen of the house has declared that she is just fine and then she ran around and exploded things. We haven’t been ingesting any sugar around here, noooooooooooo. Not us. Do you see that little scribbly black line on the forehead of my Ninja/Eva pumpkin? That would be Bug’s design. I know she’s technically not old enough to use a sharpie and mark up a pumpkin but she’s getting really close! Just look at this sketch and tell me I don’t have an artist child. 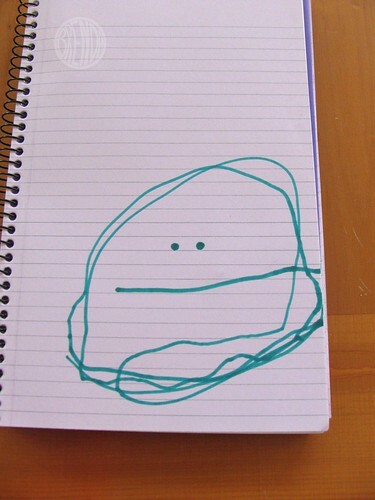 Okay, I guess she’s almost three and it’s normal for three year olds to be able to draw a face but I think her illustrations are the cutest things ever! I just want to make stuffed animals out of them and hug them. 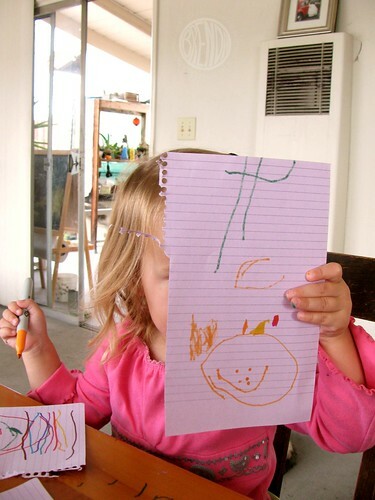 I LOVE kid art. 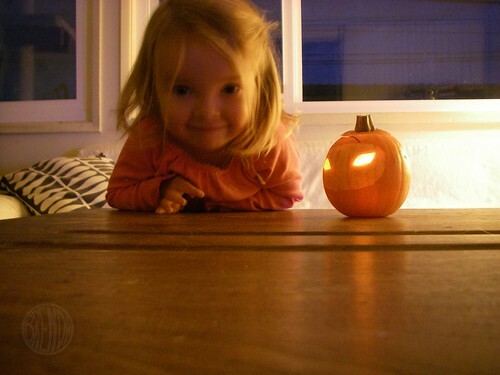 I think her plans for our pumpkins were quite clear, don’t you? Too bad I have issues with letting go and refused to carve three noses. Maybe next year. Who knows what she’ll come up with by then. I lied, I’m not getting to the paper maché stories today I guess but I will soon! I promise. I have lots of photos to share that are hilarious. Until then, have a fun Halloween! See you on the flip side! 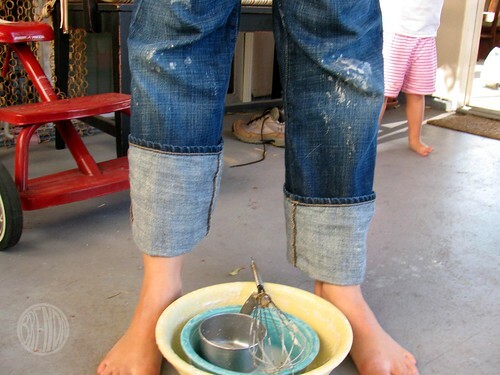 Mess Maker, Mess Maker, Make Me a Mess…. I bet you’ve been wondering what we’ve been up to. Projects galore! I will be sharing very soon over at my Alpha Mom gig but until then it’s top secret! It’s up! I’ll be back here later to fill you in on the nitty gritty details.